Saatchi Art’s curators have worked with artists from around the world to hand-pick every artwork we offer on Limited in order to provide you with an unmatched selection of limited edition prints. We are proud to offer "Swimmer No. 13" by Brigitte Yoshiko Pruchnow, which is available exclusively on Limited. Artworks in a limited edition have a set number of prints available for each size offered. For the 10x10 size edition, "Swimmer No. 13" comes in a limited edition of only 100 prints. Once all 100 of the prints in this edition size have sold out, there will be no other prints of "Swimmer No. 13" available in the size of 10 inches high by 10 inches wide. Limited edition prints of this artwork may be available in other sizes. Brigitte Yoshiko Pruchnow captures moments of serenity in her photorealist works, which are informed by her background in filmmaking. 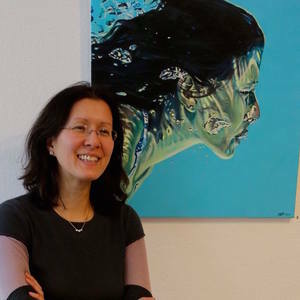 Her colorful works harken back to her Japanese heritage and experience with woodcuts and calligraphy.